The ideal reversal agent should have a fast onset; it should be efficient at any time, even soon after curarization of the patient; it should be able to provide complete reversal either for light or profound block; it should have a longer half-life than the neuromuscular-blocking agent; and, it should be free of any side-effects. Current drugs used to reverse neuromuscular block are not ideal and possess many side-effects, but sugammadex is very close to be the ideal reversal agent. Sugammadex is a modified cyclic oligosaccharide, synthesized with 1-4 glycosyl bonds made using cyclodextrin glycosyltransferase. 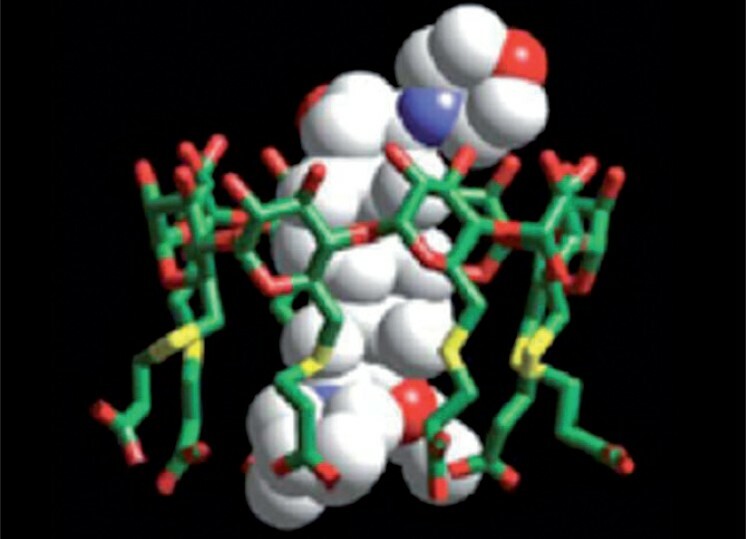 This molecule, a g-cyclodextrin, is characterized by its unique tridimensional structure [[Figure 1]; http://commons.wikimedia.org/wiki/File: Sugammadex_sodium_3D_front_view.png]. It is composed of a hydrophobic core with peripheral hydrophilic chains. Its singular structure allows aminosteroidal nondepolarizing neuromuscular blocking drugs (NMBDs) to get trapped inside. 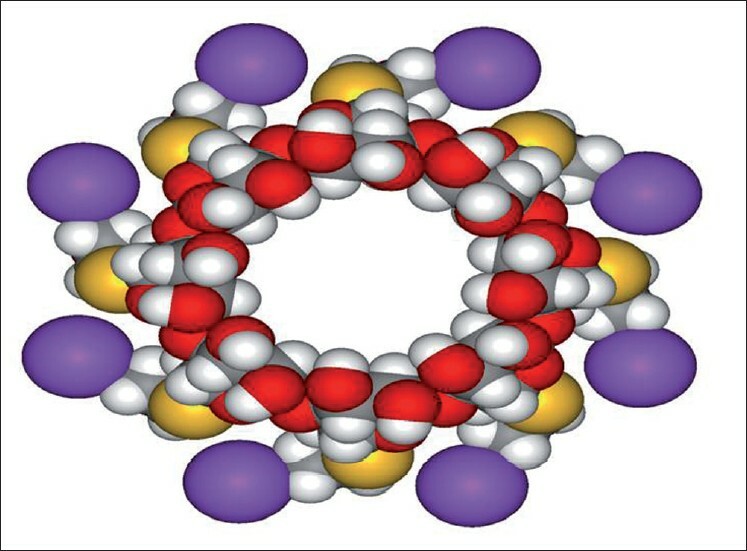 The negative charges of the external chains maintain the cavity open and the core, with Van Der Waals forces, thermodynamic bonds and hydrophobic interactions, creates a 1-1 ratio complex with very tight bonds between the NMBDs and the reversal agent. This latter complex is water soluble and can be easily excreted via urine. Because of its singular architecture, it has a low penetration of the blood-brain barrier and a low placenta transfer. It has been demonstrated using isothermal titration microcalorimetry that sugammadex can reverse rocuronium and vecuronium with high affinity and pancuronium with low affinity. It has also been shown using the same technique that the complex sugammadex-rocuronium maintains a high association rate with a low dissociation rate. For instance, only one complex sugammadex-rocuronium dissociates for every 25,000,000 complexes formed. The affinity with rocuronium is greater than that with vecuronium. Because of its great affinity with rocuronium, sugammadex is more commonly administrated in association with this latter one. The clearance of sugammadex is reduced in patients with a creatinine clearance below 30 ml/min by 17-fold and the elimination half-life is increased by 15 fold compared with patients with any renal impairment. Nevertheless, the efficacy of sugammadex is not altered and no block reoccurrence has been observed. Others studies have not demonstrated a consistency in decreasing the plasma concentration of sugammadex in patients with severe renal impairment or in those needing dialysis. , Therefore, it is recommended to avoid its use in such patients. The sugammadex-rocuronium complex is not eliminated by hepatic metabolism; therefore, hepatic impairment does not influence its excretion. However, patients with hepatic failure may have higher plasma rocuronium levels. The pharmacokinetic properties of patients admitted in the ICU have not been studied yet. The variations observed in the plasma of sugammadex are analogous to those seen in adult patients. Plasma clearance, Vdss and terminal elimination half-life increase with age. There is no clinical trial in children below 2 years. The pharmacodynamics of sugammadex and related cyclodextrins have been examined using isothermal titration microcalorimetry. Nonclinical studies using in vitro techniques (tissue bath studies) and in vivo methods (muscle contraction in anesthetized animals) were performed to investigate the pharmacodynamics and drug-drug interactions. The potency, efficacy and selectivity of sugammadex have been clearly demonstrated in both in vitro and in vivo essays. The first in vitro testing of the potency of natural cyclodextrins to reverse rocuronium-induced neuromuscular blockade was performed in isolated mice hemidiaphragm. The correlation between cavity size of the cyclodextrins (a-, ß- and μ-cyclodextrin) and their reversal activity was demonstrated [Table 1]. To prove the complex formation of rocuronium and μ-cyclodextrin (Org 25969) in vivo, experiments in female Rhesus monkeys at Radbound University in Nijmegen in 2002 and in guinea pigs at Organon Laboratories in 2003 were performed. , Based on these findings, the concept that the reversal activity of sugammadex depends on encapsulation and removal of rocuronium molecules from the nicotinic receptors to the central compartment was confirmed. The selectivity of sugammadex specific for steroidal NMBDs was studied in guinea pigs and primates as well. , During the in vivo experiments to determine the reversal effect of sugammadex in anesthetized animals, blood pressure and heart rate were continuously monitored. No changes in arterial blood pressure and heart rate were observed after the intravenous application of sugammadex [Table 2]. Upon intravenous administration, sugammadex is characterized by rapid distribution in a low-distribution volume, reflecting the extracellular water compartment. In all preclinical species studied, the systemic exposure generally increased proportional to the applied dose, with no significant differences between the gender and between single and multiple dosing. Metabolism is not a major route of clearance, and sugammadex is rapidly excreted in urine at a rate approximating the glomerular filtrating rate (Trial 19.4.107. Open, non randomized, single center trial to determine the excretion balance, metabolism profile and pharmacokinetics of Org 25969 after intravenous dose of (14C)-labeled Org 25969. Clinical trial report). De Boer performed pharamcodynamic investigations in Rhesus monkeys to demonstrate the time course and duration of action or half-life of sugammadex as well as the dose-response relationship. In contrast to acetylcholinesterase inhibitors, the reversal of profound neuromuscular blockade immediately after the administration of rocuronium could be demonstrated without any cardiovascular effects in Rhesus monkeys. At high concentrations in vitro (0.15-1.5 mM), sugammadex induced a slight increase in the action potential duration and a slight hERG channel inhibition. However, these effects are considered a nonspecific disturbance of the electrophysiological properties of these in vitro systems, and a wide safety margin is present. In all preclinical animal in vivo experiments, sugammadex showed a rapid onset, with a short time to peak effect, a faster recovery than acetylcholinesterase inhibitors and no adverse side-effects. The findings of these in vivo animal studies made an extrapolation to human situation very likely. The efficacy and safety of sugammadex in the reversal of rocuronium-induced neuromuscular blockades were evaluated in 30 phase I-III studies. A total of 2,054 subjects were exposed to sugammadex. Nineteen hundred and twenty-six patients received sugammadex after the administration of a neuromuscular blocking drug (rocuronium or vecuronium). The dose administered ranged between 2.0 and 32 mg/kg. Most subjects received sugammadex at a dose of 2.0 or 4.0 mg/kg. These clinical evaluations led to the dose-effect relationship, which recommends that a dose range of 2.0-16.0 mg/kg, depending on the level of neuromuscular block, leads to a reversal of moderate block (T2; 2.0 mg/kg), reversal of more profound block (posttetanic count [PTC] 1-2; 4.0 mg/kg) and for a rapid rescue reversal at an early stage of neuromuscular block (16.0 mg/kg) [Table 3]. ,,,,, The majority of clinical studies investigated the efficacy of sugammadex against the neuromuscular block induced by rocuronium. Table 3: Reversal of profound neuromuscular blockade. 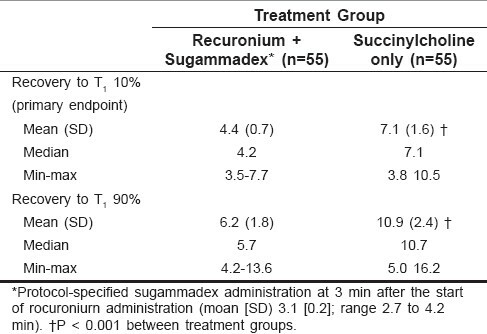 Recovery times after 1,2 mg/kg of rocuronium, with sugammadex or placebo 3 min after the administration of rocuronium. Seven phase-I studies were performed. In six of the seven trials, the pharmacokinetic profile of sugammadex was investigated when sugammadex was administered alone, in healthy volunteers who did not receive anesthesia. Only in part 2 of clinical trial 19.4.101 did volunteers receive sugammadex for the reversal of the neuromuscular blockade induced by rocuronium. Except trial 19.4.107, all phase-I trials were randomized, double-blind and cross-over trials. In all phase-I trials, 260 adult healthy volunteers received a single dose of sugammadex. Gijsenbergh et al. investigated the first exposure of sugammadex in humans (19.4.101). The trial was divided into two parts and included 29 subjects. In part 1, 19 subjects were randomized and treated with a single dose of sugammadex 0.1 mg/kg ranging up to 8.0 mg/kg or placebo application. In part 2, 10 randomized subjects under general anesthesia received sugammadex 0.1-8.0 mg/kg after the application of 0.6 mg/kg of rocuronium. One subject participating in part 1 described the occurrence of taste sensations for 43 min after the injection of 4.0 mg/kg of sugammadex. Other subjects had self-limiting parosmia of about 2 min, dry mouth sensations, changed temperature and coughing. In eight subjects, a prolonged QT interval (>450 ms) was observed. Of note, five of the eight subjects with prolonged QT interval were documented after placebo application. Peeters et al. administered (trial 19.4.106) high doses of up to 96 mg/kg of sugammadex in 13 healthy male and female volunteers. Intravenous high-dose application of sugammadex was safe and was well tolerated. No gender effects were noted. Across trials and dose groups (1.0-96 mg/kg), sugammadex was found to distribute into the extracellular water of the body and did not bind to plasma proteins or erythrocytes. Cammu et al. investigated, in trial 19.4.108, the safety of the simultaneous administration of sugammadex (16.0-32.0 mg/kg) with either rocuronium (1.2 mg/kg) or vecuronium (0.1 mg/kg) in 12 healthy volunteers. The doses were well tolerated. This study demonstrated that the dose of rocuronium and vecuronium in plasma decreases faster than that of sugammadex. Adverse events were documented in subjects in 19.4.105, 19.4.106, 19.4.108 and 19.4.109. Headache, nausea, dry mouth or hypersensitivity (following the application of 32 mg/kg of sugammadex) were noted to be possibly related to the administration of sugammadex. Phase-II consists of 12 studies that included 866 subjects. Six clinical trials investigated the "Routine reversal" of rocuronium- and vecuronium-induced neuromuscular blockade at the reappearance of the second twitch (19.4.201, 19.4.203, 19.4.207, 19.4.208A, 19.4.208B, 19.4.210). In trials 19.4.201, 19.4.207 and 19.4.210, the neuromuscular blockade was induced by the intubating dose of rocuronium only (0.6 mg/kg), while in 19.4.208 A/B, additional administrations of rocuronium were allowed. Three trials performed the sugammadex administration at the reappearance of T2 of vecuronium-induced neuromuscular block (19.4.207, 19.4.208A, 19.4.208B). Only Shields et al. studied (19.4.203) the 6.0 mg/kg dose. Thirty adult patients received rocuronium to maintain a deep block at a level of less <10 PTC <10 during propofol-nitrous oxide-opioid anesthesia. At the recovery of T2, volunteers received different doses of sugammadex (0.5-6.0 mg/kg). The mean recovery time to a TOF ratio of 0.9 decreased from 6 min 49 s in the group receiving sugammadex 0.5 mg/kg to 1 min 22 s in the 4.0 mg/kg group. The observed recovery time after the dose of 6.0 mg/kg was unexpectedly longer than the observed recovery times after 2.0-4.0 mg/kg of sugammadex. There was no explanation found for this outlaying result. The conclusion of the authors was that the administration of sugammadex was at the reappearance of T2, which is most effective at a dose of 2.0-4.0 mg/kg [Table 5]. Sugammadex for the reversal of a "deep or profound" neuromuscular blockade at PTC 1-2 or the application of sugammadex 3, 5 or 15 min after the administration of 1.2 mg/kg rocuronium ("immediate reversal") was investigated in five phase-II trials (19.4.202, 19.4.204, 19.4.205, 19.4.206, 19.4.209) [Table 6]. In all phase-II trials, there was no evidence for recurrence or residual neuromuscular blockade [Table 7]. Phase-III trials consisted of 11 studies, including a total number of 872 subjects. Blobner et al. (19.4.301) and Flockton et al. (19.4.310) showed a faster recovery after the application of sugammadex compared with neostigmine at the reappearance of T2. In 19.4.301 (n = 96), the neuromuscular blockade was induced by rocuronium. At the reappearance of TOF of T2, the reversal to a TOF ratio of 0.9 by 2.0 mg/kg sugammadex was compared with the reversal of 50 μg/kg of neostigmine. The observed mean recovery time to the TOF ratio 0.9 was estimated to be almost 13-times faster in the sugammadex group compared with the neostigmin group (1.4 vs. 17.6 min). Staals et al. (19.4.304) administered sugammadex to renal-impaired patients (creatinine clearance <30 ml/min) compared with 15 controls (creatinine clearance >80 ml/min). Rocuronium (0.6 mg/kg)-induced neuromuscular blockade was reversed by 2.0 mg of sugammadex at the reappearance of T2. The mean time of recovery to TOF of 0.9 after the application of sugammadex was 2.0 min (standard deviation 0.72) in renal patients and 1.65 min (standard deviation 0.63) in the control group. Neither sugammadex-related serious adverse events nor recurrences or residuals of neuromuscular blockade were reported. The clinical recommendations for the use of sugammadex in cardiac surgery are based on its use in three different conditions: rescue reversal for failed intubation after either normal induction or RSI, reversal at the end of surgery with the intent of immediate extubation or reversal of neuromuscular block after extubation in the ICU or intermediate or postoperative care unit. We will try to summarize the clinical recommendations for the cardiac anesthesiologist in seven points. The arrival of sugammadex does not replace good clinical practice. Objective monitoring of neuromuscular blockade remains a standard monitoring in cardiac surgery, which is as important as any other vital sign monitoring. Monitoring of the hand muscles might be impaired in cardiac surgery with prolonged surgery, peripheral vasoconstriction and hypothermia. Nevertheless, it is the best means to detect any residual paralysis at the end of surgery. Determination of a train-of-four neuromuscular response is important before any attempt of extubation occurs after cardiac surgery, either in the operating room or in the ICU. Whether sugammadex has any impact on shortening recovery after cardiac surgery needs to be shown. Neuromuscular monitoring of the corrugator supercilii muscle is a reliable method to titrate muscle relaxation during cardiac surgery, since it best reflects core muscle relaxation. Titration of muscle relaxation to a TOF ratio of 0.1-0.25 or lower at the corrugator supercilii muscle will, for most clinicians, mean to give higher doses of NMBDs thus improving core muscle relaxation and potentially improving the conditions of surgery, whereas such a profound block would have interfered with the attempt to immediately extubate after cardiac surgery previously. This is now feasible with the arrival of sugammadex. It will, in the future, be a question of price more than scientific proof, which reversal drug should be used in cardiac surgery, or any other type of surgery for that matter. The standard combination of nestigmine/glyccopyrrolate has always been specifically difficult in cardiac surgery because of the adverse arrythmogenic potential of this combination with glyccopyrrolate overdosing potentiating tachycardic arrhythmias and underdosing potentially causing bradycardic arrhythmias by neostigmine. Therefore, without taking into account sugammadex's price, sugammadex should be the reversal drug of choice, particularly in fast-track cardiac surgery. However, the still high price of sugammadex might tempt some clinicians to use lower doses of sugammadex to economize and potentially use it for several patients. It is important to note that sugammadex doses below 2 mg/kg can, by no means, be recommended. As shown in a study by Eleveld et al.,  doses below 2 mg/kg can lead to a dangerous rebound phenomenon during which rocuronium can leave the sugammadex-rocuronium complex, causing recurarization. In the event of failed intubation and failed ventilation, sugammadex offers the treatment of choice of rapid reversal of neuromuscular blockade. Regardless of the dose of rocuronium given for induction, a dose of 16 mg/kg of sugammadex is recommended to achieve the quickest reversal of neuromuscular blockade possible. Sufficient return of neuromuscular transmission should be achieved within 3-7 min, depending on the initial dose of rocuronium given and the delay between rocuronium and sugammadex administration. Sugammadex should, regardless of its cost, be readily available and used for this indication in all cases. Reversal with sugammadex: before extubation, neuromuscular blockade should be determined using objective monitoring methods, such as acceleromyography, electromyography or kinemyography. If a train-of-four of <0.9 is determined at the hand muscles, reversal of neuromuscular blockade is recommended. Sugammadex at 2 mg/kg is the recommended dose to achieve normal neuromuscular transmission predictably in all patients. Higher doses of sugammadex might achieve the establishment of normal neuromuscular transmission quicker, but considering the high costs of sugammadex, return of neuromuscular transmission a couple of minutes earlier makes no difference after cardiac surgery. In any case, reassessment of neuromuscular transmission using train-of-four stimulation 5 min after sugammadex is given is recommended as part of good clinical practice. In conclusion, sugammadex provides a unique opportunity for cardiac anesthesiologists. Reliable and fast reversal of neuromuscular blockade is available without any important side-effects for this high-risk population of patients. Cardiac surgery is still considered a type of surgery where significant neuromuscular blockade is achieved as part of routine practice during most of the surgery. Very profound blockade, however, is not necessary. With the arrival of sugammadex, cardiac anesthesiologists will be hard pressed to use any other NMBD than rocuronium or vecuronium. It is important to keep in mind that using sugammadex in doses <2 mg/kg can endanger the patient because of the inherent risk of recurarization. Neuromuscular monitoring and careful, titrated use of NMBD will be the pillars of our clinical practice even with the more widespread use of sugammadex; unnecessary profound NMB cannot be justified by the availability of sugammadex. 3. Available from: http://www.emeaeuropa.eu [internet] Agency EM. Bridion (sugammadex sodium) 100 mg/mL: summary of product characteristics. Available from: http://www.emeaeuropa.eu/humandocs/PDFs/EPAR/bridion/H-885-PI-enpdf [Last accessed on 2009 Feb 5]. 10. Staals LM, Snoeck MM, Driessen JJ, Flockton EA, Heeringa M, Hunter JM. Multicentre, parallel-group, comparative trial evaluating the efficacy and safety of sugammadex in patients with end-stage renal failure or normal renal function. Br J Anaesth 2008;101:492-7. 13. Puhringer FK, Rex C, Sielenkamper AW, Claudius C, Larsen PB, Prins ME, et al. Reversal of profound, high-dose rocuronium-induced neuromuscular blockade by sugammadex at two different time points: An international, multicenter, randomized, dose-finding, safety assessor-blinded, phase II trial. Anesthesiology 2008;109:188-97. CÃ¡rdenas, V.H.G. and GonzÃ¡lez, F.D.M. Qi, Y.-M. and Jie, Q. and Zhang, F.-M. and Yu, B.-C. and Ding, D. and Qi, Y.-B. Stair, C. and Fernandez-Bustamante, A.
Nauheimer, D. and Kollath, C. and Geldner, G.
14 Is it not the time to stop the use of scoline® (suxamethonium chloride) for rapid sequence intubation? McGuigan, P.J., Shields, M.O., McCourt, K.C.